You are gliding effortlessly from aisle to aisle, instantly finding each and every item you need. Everything’s on sale, your list is overflowing with deeply satisfying checkmarks, and your shopping cart wheels are completely squeak-free. Oh, and they’re playing Adele over the store’s loudspeakers. …until your tantrum-throwing toddler turns it into a total nightmare! Out of nowhere, your kid is screaming, crying, kicking and collapsing onto the linoleum all because of some silly, sugary treat he just has to have. But you can’t give it to him, right? You’re no schmuck, so you know that doing what he wants right now will only encourage him to throw more tantrums in the future. And since this one, single tantrum already constitutes your own personal version of hell, you’re not about to let that happen. At this point, lots of parenting resources would claim to give you one “sure-fire” way to tame your child’s tantrum. But The Doctor + The Dad, thanks to our three angelic/demonic children, know us some tantrums. And we also know that the same strategy won’t work on every tantrum, every time. So instead of a single one-size-fits-all solution, we’re giving you a whole tantrum toolset! You can try each tactic below to deal with six different fits, or use multiple solutions at the same time. We’re all for whatever makes the whining stop – except giving in and handing over that treat, of course! For both your sakes, you can try salvaging any positive feelings your shopping trip may have previously held by simply distracting your child from his fit. You can start talking to him about something else (“What should we play when we get home?”), give him a couple of grapes out of your grocery cart, point out something interesting to look at (“Oh look, that small dog is dressed exactly like its owner”), or absolutely anything else you can think of that might help him move on. We’ve found that one of the most effective ways to stop our son’s tantrums is to touch him. He really responds to a mid-meltdown massage, tickle or cuddle. Not only does it distract him by helping him to focus on other sensations, but it also helps to reconnect you and your child after the emotional separation that a conniption fit causes. Taking deep breaths can help your child and you calm down when things get tough. We like to coach our kids through it by saying, “Breathe in like you’re smelling a flower, breathe out like you’re blowing out a candle…” Repeat as needed. It might sound like some kind of crazy incantation, but if it can summon some serenity from your little sweetie, then we think it’s well worth it. Especially if you’ve already tried some of the above tools without success, you may have deduced that your child’s tantrum is just a really loud last-ditch effort to get what she wants. 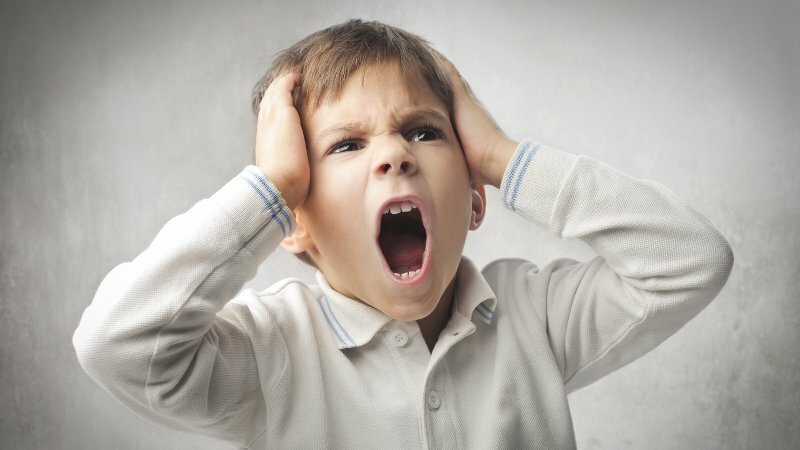 Although kids often throw tantrums because they’re having difficulty handling big feelings, sometimes a meltdown is just an effort at manipulation. In that case, she’ll get over it soon. And if you ignore it, she’ll learn that throwing a tantrum didn’t get her anything – so next time she might as well skip it. If tantrums are becoming a pattern for your little one, you might want to try positive reinforcement to help prevent future outbursts. On occasions when you witness your kiddo deal with problems in a calmer, more productive way (as rare as those may be), make sure to give him plenty of compliments. And if you’re really desperate, you could offer a reward system such as earning a sticker for every day he doesn’t throw a fit, and a special reward once he’s accumulated five stickers. Full disclosure: our son declined this exact offer, informing us that he’d rather have fits than rewards. But maybe you’ll have better luck than we did. We acknowledge that all of this might sound easier said than done. As you try out these tools, you’ll likely get sideways glances and unwanted advice from fellow shoppers, and the guy with the mop performing a cleanup on Aisle Three. But stay strong, ignore the haters and keep your head held high. Anyone who doesn’t recognize your wisdom for not giving in to your toddler’s demands and running out of the grocery store at your kid’s first sign of distress either has never had kids, or doesn’t actually remember what having kids is like. Some tantrums last long still, but some will end quick instea-ehhh-ehhhh-ed. So how do you deal with your kids’ tantrums? Share your favorite strategies – or inspirational Adele lyrics – in the comments!